Please join us on Friday, June 19 from 5-9 pm to celebrate PondView's 5th Anniversary with wine, food and great company! 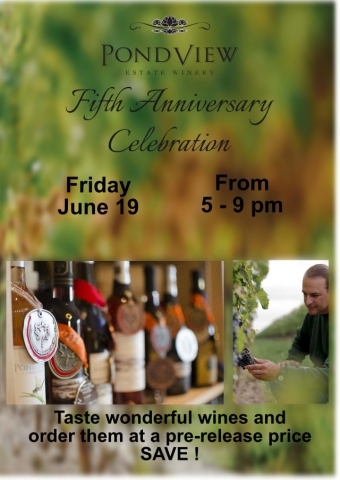 It has been 5 years this month since PondView Estate Winery opened its doors in beautiful Niagara-on-the-Lake. The last 5 years, since our opening in 2010, have been a great ride. We certainly could not have come this far without you, our loyal customers and friends. 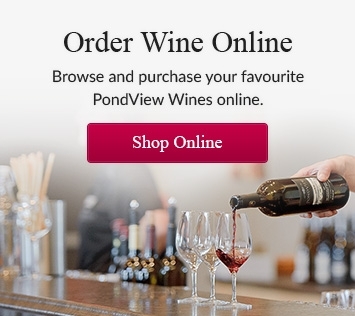 Many of you have watched us over the years as we have produced the PondView wines you have come to love and enjoy. To thank you for your encouragement and support, we invite you to celebrate our 5th Anniversary with us. We have partnered with our friends from Silversmith Brewery who will be providing some of their delicious beer. Live music will be provided by 3 Sheets 2 the Wind. And best of all, Lou will be behind the BBQ preparing some of his favorite treats! These tastings are only being offered on this special night and can be pre-ordered to save you money. Today our shelves look a lot different than when we first opened! When we look at these before and after photos, we are astonished at how we have grown. Each of us in the PondView family is proud of the past five years and very excited about the next five! We truly hope you can join us for this wonderful evening, where you'll also be able to take advantage of some amazing savings and limited time offers on PondView wines.